Oxford Bookworms 3. 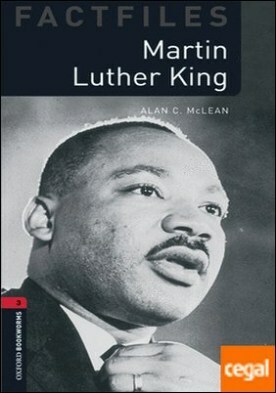 Martin Luther King MP3 Pack por McLean, Alan C.
A non-fiction book, ideal for intermediate learners of English looking to improve and practise their English. The book is filled with useful vocabulary that is carefully graded and easy to understand, it also comes with audio, so that you can listen at the same time as reading.The United States in the 1950s abd 60s was a troubled place. Black people were angry, because they did not have the same rights as whites. It was a time of angry words, of marches, of protests, a time of bombs and killings.But above the angry noise came the voice of one man – a man of peace. ‘I have a dream,’ said Martin Luther King, and it was a dream of blacks and whites living together in peace and freedom. This is the story of an extraordinary man, who changed American history in his short life.